To help, we’ve collected some tips from universities across the country who have had success getting students to use newly adopted software. Not only can this help to justify the cost of technology purchases, but also to increase the retention and achievement of the students who use those purchases. While these tips come from those in higher education, many can also benefit others, including K-12 schools and corporations who are looking to get the word out about technology. A big thanks to Mary Allard, VP of Marketing at Texthelp for helping to pull these together. Catch students as early as possible. The majority of students attend an orientation before they officially begin college. This is a great time to distribute literature on software that is available to them. 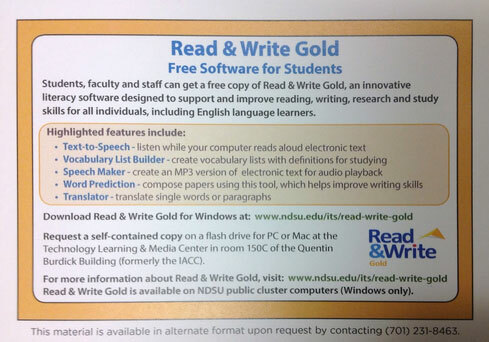 For example, North Dakota State University added postcards to orientation packets in addition to dropping off additional copies at the student affairs office (see image below). Get other departments involved. Chances are most software that has been purchased can benefit a large number of students campus-wide. For example, if Disability Services purchases new literacy support software, make it a point to advertise it and offer training to other departments such as TRIO, ELL/ESL, Academic Support Services, Athletics, Veterans Affairs, and more. Integrate into “University 101” classes. Many schools require students to take part in a semester or year-long introductory course that is designed to assist them in making a successful transition into Higher Education. Take advantage of these classes to teach students about the software and how to access it. 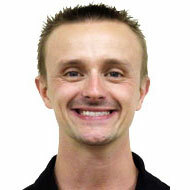 If possible, include information about the software in course materials or build in an assignment requiring actual use. Offer evening coffee and training social events. Students love their Starbucks. Advertise and offer free coffee social events in the evening where students can learn about new technology. Keep the training focused on one or two specific features as opposed to trying to cover everything in 30 minutes. Send email, text, and listserv announcements. In addition to email, many universities now send students who opt in text message alerts about events, announcements and more. Use this channel to inform students of new technology available with a link to learn more. Also, take advantage of listservs to connect with staff, faculty, and students. Install and advertise software on public computers in the library and other locations. If possible include a way to let students know that the software is installed on a computer or computers in a public location. For example, placing a sticker on the monitor, having a quick reference card available next to the computer, or placing posters or signs in the lab are all ways to inform students about the software. 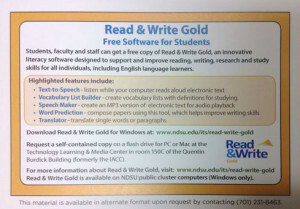 Below is an image of a sticker several schools attached to computer monitors to let students know Read&Write Gold literacy support software was available on that machine. Announce and allow students to easily download software from the university website. Most universities have a learning management system such as Blackboard, Moodle, or Desire2Learn that all students can access through a login. Consider announcing the availability of the software on the LMS home page with a link to download it to students’ personal computers. This has the added benefit of tracking how many times the software is downloaded. Follow up throughout the year. Don’t limit your outreach to the beginning of the year. Use the same strategies in an ongoing effort. As the school year progresses, send reminders to staff and students about the software and support available. Share success stories. Success creates more success. Share videos, images, or stories of students who are successfully using the technology. 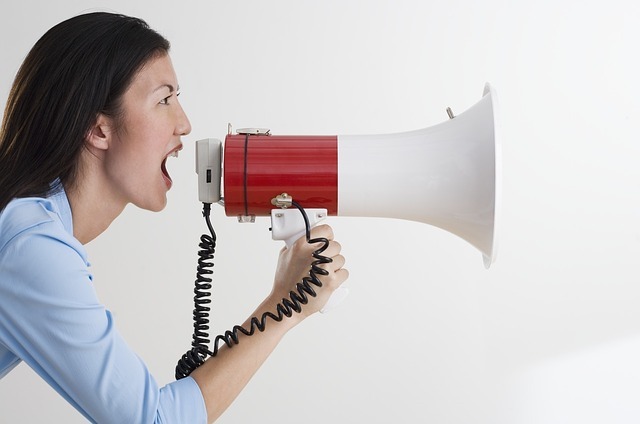 Enlist students to help promote use or train other students. Offer additional services. Many Disability Services offices go above and beyond providing access to software and support for students. However, getting students to actually come in to the office can be difficult. Consider allowing reluctant students to text their questions or requests. Provide monitored testing areas where students can take assessments while using assistive technology, scanning stations for students to make their books and other materials accessible, or student experts that can share their experiences and best practices with others. Create or partner with clubs/societies on campus (e.g. Delta Alpha Pi Honor Society for Students with Disabilities) to help get the word out to members. Hopefully some of these ideas will prove useful in your setting. What other ideas have worked for you? Please include in the comments section below.